The Marines are shaking up their force in Europe, adding a one-of-a-kind Combined Arms Company to the Black Sea Rotational Force to train with local partners and allies on anti-tank capabilities. 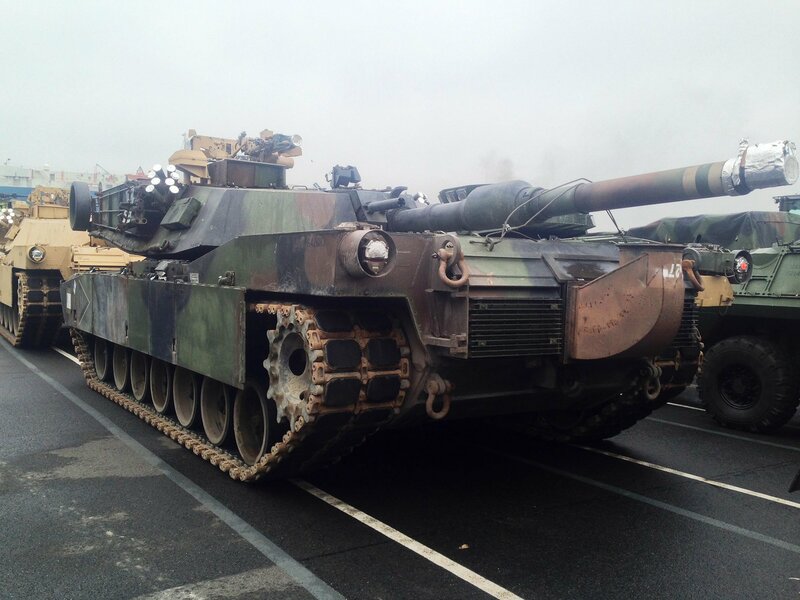 Four M1A1 Abrams tanks, three M777 155mm field artillery pieces and six light-armored vehicles (LAVs) LAV-25 arrived in Bremerhaven, Germany, on Sunday, and will be boarded onto trains and sent to their new home in Novo Selo Training Area in Bulgaria, according to a U.S. Marine Corps Forces Europe statement. The Black Sea Rotational Force, established in 2010, is based at the Mihail Koglinceanu Air Base in Romania and consists of about 265 Marines. That force rotates semi-annually and has traveled the region doing theater security cooperation (TSC) exercises. It recently was pulled under a common headquarters with the Europe-based Special Purpose Marine Air-Ground Task Force (MAGTF) Crisis Response Africa, which provides a similar capability to U.S. Africa Command. But these forces have never had the capability to do anti-tank training – nor has any other Marine unit around the world. With the tanks, LAVs and artillery, “combine that with CAAT (combined anti-armor team) platoons, the heavy weapons companies and those sorts of assets, and you’ve got a more comprehensive take and training on anti-armor,” U.S. Marine Corps Forces Europe spokesman Capt. Richard Ulsh told USNI News. Ulsh said the new company is the only of its kind in the Marine Corps and was created specifically for the current situation in Europe. Many close partners and allies, particularly in Eastern Europe, are concerned that Russia’s expansion won’t stop in Ukraine, where columns of tanks poured across the border last year even as Russia denied invading its neighbor. The creation of the new combined arms company is “a demonstration of our resolve to our allies and our partners in the region,” Ulsh said. The heavy equipment and about 160 Marines from II Marine Expeditionary Force are meant to work with European militaries’ mechanized units to improve their collective combined arms skills and anti-armor tactics, the Marine Corps statement said. The combined arms company will be stationed in Bulgaria in part to spread out the force and create a larger footprint, and in part because the Novo Selo Training Area is optimized for the type of exercises the Marines hope to do, Ulsh said.